One of our favorite Stuff the Bus stops each year. Help the members of American Legion Jay Wilson Post 112 keep the homeless warm. 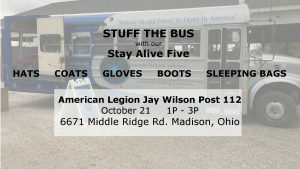 Help them Stuff the Bus at Sub Zero Mission Headquarters.